Pregnancy, prolonged standing, and heredity are the primary causes of unsightly and often painful varicose and spider veins. As we age, more visible leg veins frequently emerge and our existing veins become increasingly noticeable. Spider veins most commonly show up on the legs but can also appear on the face. There is a simple solution to this problem. A sclerosing solution – and a cosmetic procedure called Sclerotherapy. 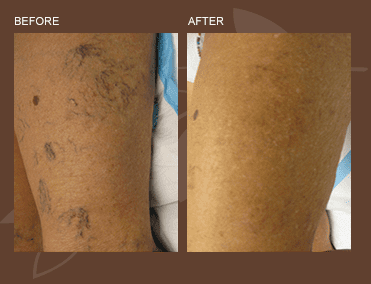 Typically, Sclerotherapy is combined with Laser Vein Treatment for maximum results. During treatment, a sclerosing agent is injected into the vein through a tiny needle. Upon injection the solution replaces the blood in the vein generating irritation and ultimately drying up the vessel walls. The body then starts a natural healing process and the vein begins to decompose, shrink and eventually disappear. Depending on the number of veins being treated in any given session, treatment can last anywhere from 15- 45 minutes. consultation, you will be advised as to the required number of treatments needed. Most patients need from 1-4 treatment sessions depending on the amount of spider veins present. Treatment sessions are spaced apart 3-4 weeks to allow for the veins to disappear. Then Dr. Morris can better assess what veins are left to treat on subsequent visits. In most cases, you will be able to immediately resume regular activities. However, excessive standing or vigorous activities are not advised for at least 24 – 48 hours. Following treatment, the affected veins may darken and the area may appear bruised. After the treatment of larger vessels, affected areas may appear pigmented but this is only temporary and will fade over time. Support hose or a snug wrapping of the treated area may be recommended. Pricing is based on the number of veins treated and the amount of time involved with each session. Each session ranges in cost from 325.00- 450.00. Schedule your free consultation today and discover how sclerotherapy can benefit you! All patients are different, results depicted in the photographs are not necessarily representative of all results, and individual results may vary.